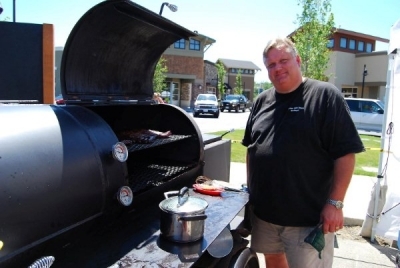 Tom Wallin has been grilling and barbecuing most of his life, however his true "obsession" with real "low n' slow" southern style barbecue began in 2004 when he and his wife (Kay) became Kansas City Barbecue Society Certified BBQ Judges and in the process were introduced to the world of Competition BBQ. After having a new custom BBQ Pit built, he entered his first competition in early 2005 under the name Dances With Smoke Barbeque. During the past eleven years he has competed in over 120 competitions all over the US and western Canada. Dances With Smoke has been Grand Champion at 16 competitions, including the 2008 and 2014 Canadian National BBQ Championship, and earned 24 Reserve Grand Champion titles. He has also been Grand Champion at State BBQ Championships in Washington (multiple times) and Oregon. Additionally, over the years he has been Reserve Grand Champion at State Championships in Washington, Oregon, Idaho, Montana, and the Provincial Championship in British Columbia. He was also Reserve Grand at the 2009 and 2015 Canadian National BBQ Championship. He has assembled 57 First Place category finishes so far in his career, along with 46 Second Place finishes. 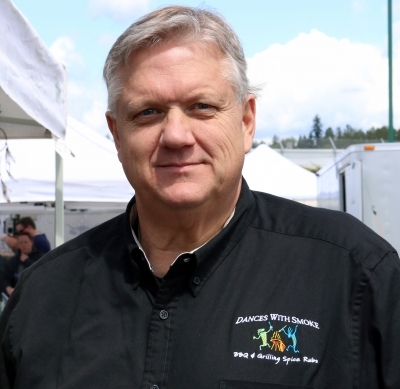 Dances With Smoke Barbeque was the Pacific Northwest Barbecue Association's Team of the Year in 2007, 2008, 2009 and 2015. 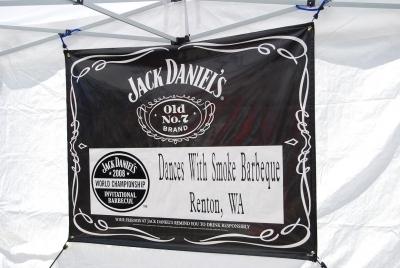 In 2008, Dances With Smoke competed at the Jack Daniel's World Invitational BBQ Championship in Lynchburg, TN, which for BBQ teams is like the world series of BBQ. 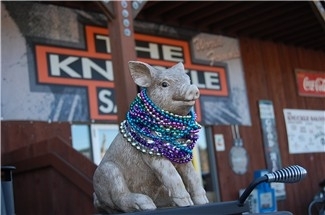 The event brings in the top 78 barbecue teams from all over the world. He took a 6th Place finish in Beef Brisket and placed 29th overall. The next year, he competed in the American Royal Barbeque Championship in Kansas City, MO. This is the largest BBQ Competition in the world. That year, the Open Competition had 473 teams from around the World competing. His Pork Ribs placed 33rd out of 472 other entries. More recently, he took a 1st Place in Beef Brisket against 111 other teams at the ACM BBQ Throwdown in Las Vegas, NV. 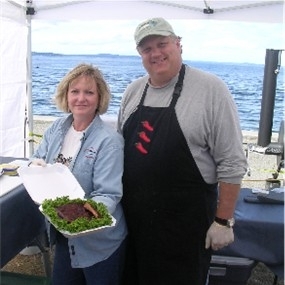 Tom served on the Board of Directors of the Pacific Northwest Barbecue Association for 5 years, having served two of those years as President. After a year and a half off the Board, he was appointed to file a vacant position on the Board and was just elected to serve as Vice President through 2014. The PNWBA has 600 plus members and puts on BBQ Competitions and Classes throughout the five western US States and the four western Provinces of Canada. It organizes and sanctions approximately 38 events each year. The PNWBA is a 501c3 non-profit organization and many of their events help of raise money for local charities. After years of filling friends, clients, and sometimes strangers, requests for bottles of his award winning spice rubs to use at home, Tom launched Dances With Smoke BBQ & Grilling Rubs at the beginning of 2010. The first two products were a Steak Rub and a Lemon Rub. A few months later his competition tested Pork and Briskets Rubs were for sale as well. Click on the Products page for more information. Just finished saucing ribs at an event in Birch Bay, Washington called BBQ on the Border. Kay about to turn-in our pork rib box at Alki Beach.